I want to blog every day. About knitting, quilting, homekeeping and cooking. Yet I'm so busy working, planning a wedding and preparing to relocate to another state that I feel blessed to have a little time each night to knit. And I'd rather knit than blog at this point. Maybe I should blog for a while about the wedding plans and moving; there's plenty to tell about those things! Boring? Or would you like to be a fly on the wall in my frantic life for the next few months? Leave a comment and let me know! There has been knitting, though, and a few Finished Objects I've neglected to sare with you. Started and finished during the first week of December, 2007. The yarn is Cascade Pastaza, an incredible soft and warm wool/alpaca blend. Yum! A simple K1P1 rib on size 8 (US) needles. No pattern...well, just one in my head. Hats are simple! A few days after I gave Eric his hat, he mentioned that he didn't have a Christmas stocking. Well, what's a fiance to do? 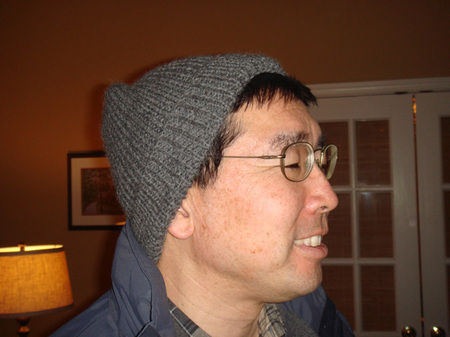 Knit one! The yarn is a one-ply chunky tweed (I'll get the brand and name for you, I promise!) 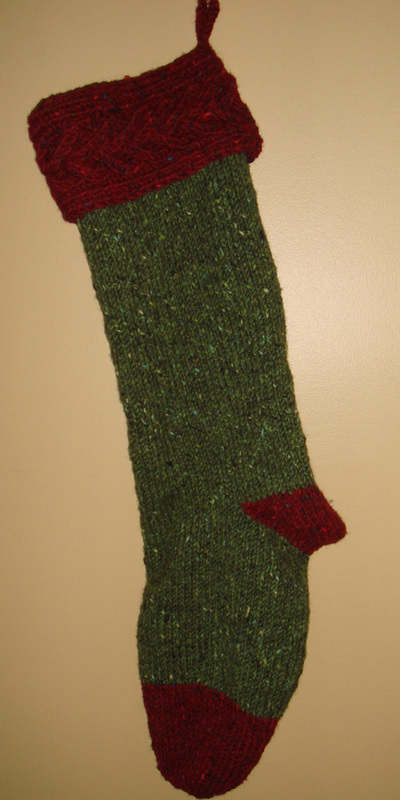 and the finished stocking is 30" long; lots of room for goodies! No pattern; again, this was just an idea in my head. I knit the cuff first in a cable pattern that I thought would look pleasing (and was the right width. Then I just knit a big top-down sock and attached the cuff to the tope edge by knitting the two together as I bound off the stitches for a nice, finished edge. 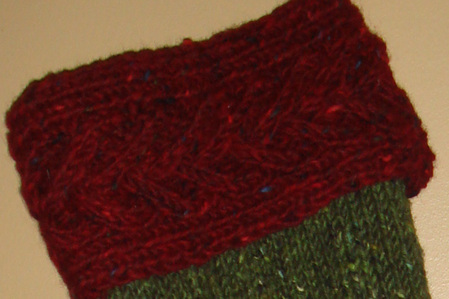 When I knit another, I'll modify the toe; it's too long (too much red). Please tell me if you like this stocking; the pattern will be available in July or August. A Pair of Socks. 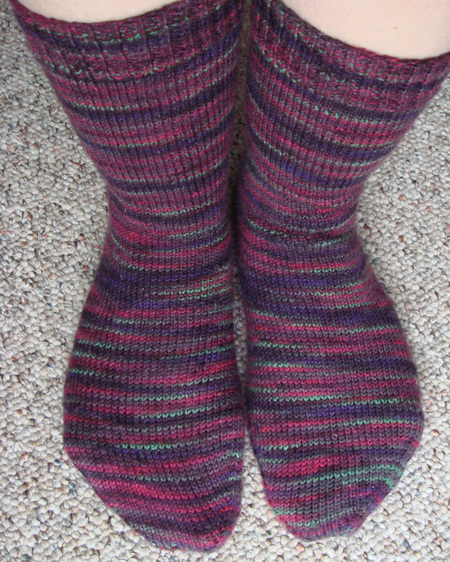 Cherry Tree Hill Supersock, two size 2 circulars, my basic sock recipe. I love the yarn, love the socks, love having warm toes! So, you see, there has been knitting going on here, along with everything else. And I will blog again tomorrow. :-) More knitting: the scarf is done and I've been working on something from Elsebeth Lavold's Viking Knits II.